1. Ten Word Wiki may provide you with a few minutes of enjoyment on this Friday afternoon. Pretty self-explanatory, this site describes random things in exactly ten words. For example, here’s the entry for Canada: “Similar to America, except more laid-back, worse at hockey.” Whooooa! Them’s fitting words. Someone needs to remedy that entry, stat! 2. 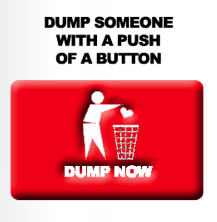 Just when you thought getting dumped the old fashioned way was depressing, just wait until you hear about Bradley Laborman‘s company IDUMP4U. Not feeling up to being a decent human being and ending your relationship yourself? Well, you’re in luck. For a measly $10 fee ($25 to end an engagement and $50 to initiate a divorce), Mr. Laborman will take it upon himself to call your significant other and break the news. He then uploads audio from the call to the IDUMP4U website, a “therapeutic” act, according to him. 3. Finally, a shout-out to Paul Chaney, the fabulous keynote speaker at the very successful inaugural Ottawa Web Marketing Club event yesterday morning. Check out his blog for some key insight into social media: The Social Media Handyman.